As the mother of two older boys, Andrea Antelope hasn’t cared for a newborn in years. 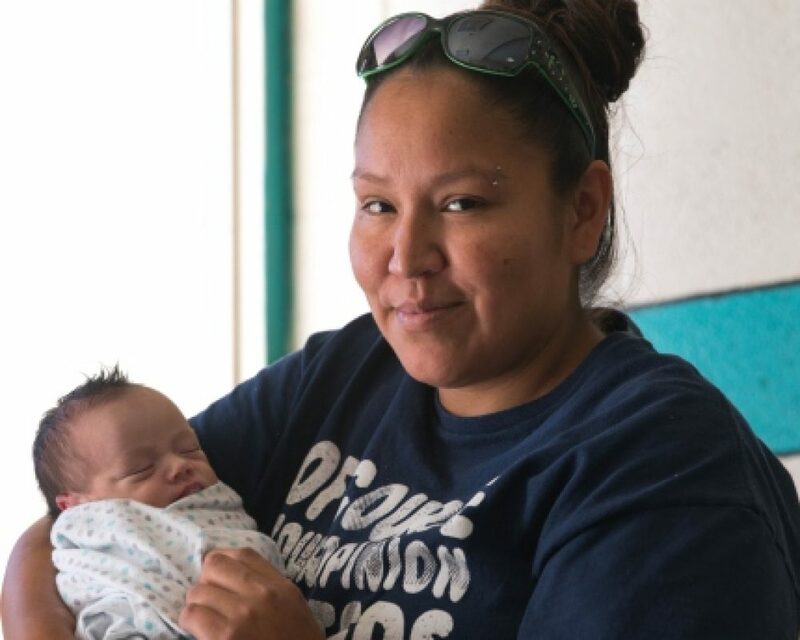 But with guidance from her home educator, Elsie Charging Crow, she is learning to manage the first months of motherhood again—and envisioning a bright future for her family. “The program helps because if I have questions, Elsie can answer them,” says 31-year-old Andrea, who participates in in the Wind River Family Spirit home visiting program. Elsie and her colleagues use the evidence-based Family Spirit home visiting model, which was specifically designed to strengthen the health and development of Native American families. On this day, Andrea has a lot of questions about caring for her 1-week-old son, Jonathan. After she greets Elsie with a shy smile, the two women sit together at Andrea’s kitchen table for a lesson on how to comfort your baby. After completing the lesson, Elsie checks in with Andrea about how her cesarean incision is healing and how the baby is breastfeeding. “What happens when he’s draining my milk?” Andrea asks. Elsie explains that the more Andrea breastfeeds, the more milk she’ll produce. She also reminds her to switch sides, and recommends applying pressure to her breast to release milk. Andrea then wonders how old her son should be before she takes him outside. Elsie’s wisdom about Northern Arapaho traditions and guidance on Jonathan’s development—and Andrea’s overall well-being—have been essential to Andrea as she reshapes her life. She left an unhealthy relationship and recently completed an alcohol treatment program. Her older sons are living with her again after staying for a few years with her aunt. As Andrea focuses on motherhood, she’s also making plans for her future. She intends to become a Certified Nursing Assistant, and she’s feeling more self-assured that she’ll reach her goals. Thank you to Andrea for sharing her story with Gillian Gaynair, a senior writer at the Urban Institute, so it could be featured on the NHVRC website.